Where the hell is Matt? has a new dancing video up. (I danced with Matt in 2007.) Speaking of dancing, I couldn’t do the easy dance routine for National Dance Day. I’m thinking of writing them a letter about it. They go way too fast when demonstrating the steps, and they don’t break it down enough for non-dancers. Maybe it’s just fine for most people, but for slow people like me, I just can’t grasp what they’re doing. I feel like going by with a sign that says, “Leave Katie Alone!” with a little crying face. Except, she voluntarily married Tom Cruise, and Scientology’s aggressive tactics have been well known for decades. 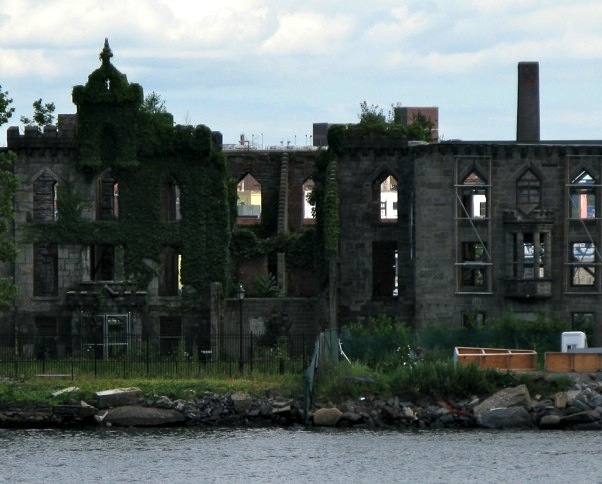 The ruins on Roosevelt Island. Stacy, love that photo, I’ve often wished I could go snooping there. I’m sorry I missed the opportunity to do so years ago, decades ago actually, when the fence was easy to get around and no one was paying attention really.